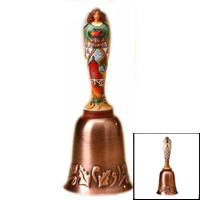 Fall Angel Bell | Jim Shore Ornaments Figurines | One Price Low Flat Shipping! From the Jim Shore Heartwood Creek Collection, Fall Angel Bell. Made of stone resin and steel; Measures 6" tall. The Fall Angel Bell features a steel bell with a resin handle featuring an angel holding a basket filled with harvested fruit and wearing a green dress decorated with a quilted farm scene.